User experience and interaction design brings value when it is purposeful, understanding, aesthetic, timeless, honest, and simple. Often, especially when pitching for new work to clients who have little understanding of what you do, it's worth reminding them of the value you bring to their business. User experience and interaction design brings value when it is purposeful, understanding, aesthetic, timeless, honest, and simple. These six principles I created over time, working as a UX designer and art director at SapientNitro. They are inspired by various design thinkers such as Dieter Rams and Erik Spiekerman. Good design is useful for how contents are presented and made accessible to users, which is its ultimate purpose. It should also be innovative in how technology is used and yet easily usable. 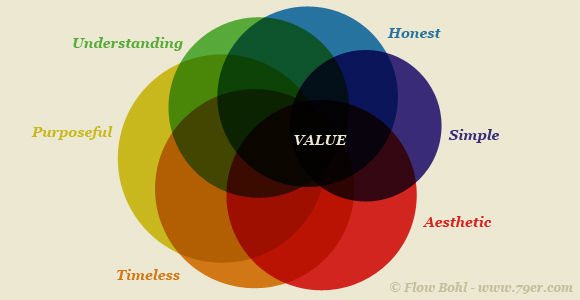 Another purpose is to create value for clients and users alike. From a client's perspective, the design needs to address the brand values. From a user's perspective the design needs to be meaningful in that it reflects a user's cultural values. It should inspire them to engage with the various contents. Ignoring conventions for the mere sake of being different or innovative can backfire. Make sure you have clear objectives of what you want to achieve and know how you want to measure them. Increasing sales for example is not a clear enough objective. Instead, think about how you want to achieve it, for example by increasing the conversion rate. The aim is to deliver the right thing and not just the thing right. Nothing is worse than to be ignored, ideally users memorize their visits and return. How do you make them return? By understanding what users are looking for. It lies at the heart of good design, to address users' needs and wants by speaking their visual and verbal language. It should clarify options and make them in the best case self-explanatory. The famous product designer Dieter Rams once said, 'Indifference towards people and the reality in which they live is actually the one and only cardinal sin in design'. Make sure you have identified audiences and create personas or scenarios that are most relevant to your business. Crafting a product well is as important as having a good idea, one holds little value without the other. Design can go beyond the initial idea. Visuals can make or break the emotional appeal of a product or interface and emotions are important to create lasting relationships. Aesthetics are not only an enticing starting point in a relationship, not only important to get attention and help persuasion but it also is a point of reassurance. People tend to rationalize their choices retrospectively and visual appeal often contributes towards a favourable attitude of a product or service. Make sure you understand the brand values and the content structure. In case you're lucky enough to work on a product or service that is meant to last a few years, you should try to avoid following fashions. Ideally you appear to innovate more than you appear to imitate to demonstrate thought leadership. The advantage of digital media is that it is flexible and dynamic. It aims at creating a dialogue with the consumer, therefore the design should be responsive and adaptable allowing users to customize their experience as they go through their online journey. Design evolves over time and the web site infrastructure ideally caters for incremental improvements. Make sure you know how people can engage with the content, with technical possibilities and scope in mind. Companies often overstate their relevance for consumers' lives, which can stoke cynicism and undermine trust. Realistically, a product's or service's ability to change a consumer's life in today's over-saturated brand landscape is small at best. Communication should be humble, not attempting to manipulate a user but instead live up to its promise. Design is humble by being unobtrusive and fulfilling its purpose like a tool kit. It should be restrained, to leave room for a user's self-expression. Attention to detail in the design process ultimately proves how much creators care for the users of their products or services. Make sure you know the legal and moral boundaries of your work and you understand the competitive environment. Concision provides focus, limits confusion and enables users to make choices confidently. It is the rigorous clarity, efficiency and effectiveness of communication that will determine the extent to which users can complete tasks. Less is more. For the web site this means, the screen should only display content that is relevant to visitors. Not everything is equally relevant and the lowest common denominator is not the best solution. Don't try to address all identified audience types at once, instead, minimize clutter and try to concentrate on the essential aspects. Make sure the work you create has the potential to win awards. Have the confidence to say no to clients, they respect you more if you do.